(facing camera) At the pledge table, Michael Titterton, HPR president & general manager, flanked by Valerie Yee, vice president & assistant g.m., and Bill Dorman, news director. 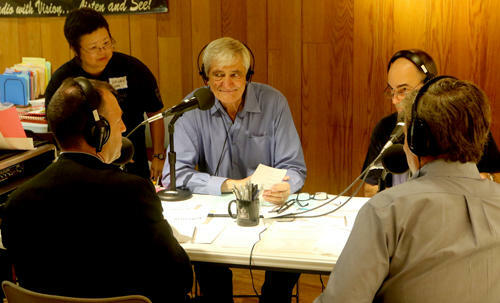 Hawaiʻi Public Radio launches its semiannual on-air fundraiser on October 13 at 6:18 a.m. The original campaign goal for “Celebration 2015” of $978,000 was 25% lower than the goal for the drive just one year ago, due to the increased participation in the station’s monthly subscription-based model known as Sustaining Membership. A record amount in early donations has further reduced this fall's on-air goal and the current estimate of what remains to be raised in pledge calls and online donations is $825,000. President and General Manager Michael Titterton remarks, “HPR is financially and operationally healthier than ever, but the lowered goal for this drive came about not because the costs of running a statewide network or purchasing national and international programming have come down. No, the real engineers of this happy event are our more than 3,300 Sustaining Members and 958 Early Bird donors who have taken to heart the idea of public radio." HPR is a locally-based, independent nonprofit, with no state, University, or PBS affiliation. Its 12,267 members provide approximately 65 per cent of the station’s income. And, of the $4.8 million needed to run the statewide radio network, 93 per cent comes from individuals and Hawaiʻi-based companies. From October 13 until the conclusion of the drive, the station opens its Kāheka Street facility to the community: approximately 150 leaders from the business and nonprofit sectors share the microphones with HPR hosts, and more than 500 volunteers staff two “Pledge Central” phone banks. Among the organizations providing volunteer support this fall are: Hawaiʻi Meals on Wheels, American Savings Bank, Hawaiian Electric Industries (HEI), First Insurance, Lima Kōkua, Aloha Harvest, Teach for America, and the Awesome Foundation.